Nowadays food delivery apps are increasing because people became very busy with their works. so, they have no time to cook or to wait in restaurants. At that time, the food delivery apps came into existence. People liked these food delivery apps very much. Because at anywhere they will order their favourite food in favourite restaurants online at their fingertips. Mobile apps are covering each and every niche for people to use every time. In this time the concept of food delivery is covered by the people and created a food delivery mobile application. These food delivery mobile apps have given a solution to the people who didn’t like the waiting time in the restaurant or who are busy with their works. The food delivery mobile app contains all the restaurants and their dishes. People will search their restaurant name or items in the search bar. Then they will find the restaurants related to the searched menu item or they will find the menu items related to the searched restaurant. In the app also people will also find the offers and they will set their current location. People will add their favourite items to the cart. At the time of checkout, people will pay through different payment types like Paytm, Phone pe, in-built app wallet, Debit or Credit cards etc. Users will see their past order history, payments, wallet amount and they will manage their delivery addresses. This is the basic section of every app. Users can log in/signup using social media credentials to order food online. Users can search for nearby restaurants or search their favourite food then they will get restaurants or restaurant menu items. Users can check offers to save money while ordering food online. Users can move their selected items to the cart. After that place an order. Users can pay their amount through in-app, means paytm, phonepe, credit or debit cards etc. Users can quickly pay the order amount through the in-app wallet present in the food delivery app. After order placed users can also track the order and get an estimated delivery time. Users can also book the table in a restaurant by selecting the date and time. Users can order the food for parties and events also from their favourite restaurants. Users can give the rating to the restaurant or driver(ordered) or they can also give reviews about the service. If users want any information about payments and orders they will contact to customer support. Customer can easily reorder the previously ordered food item. It is a very easy process and taking less time to reorder the previous order. This mobile OTP verification is for sign in to confirm their mobile number. Auto-detecting the location is a simple way compared to entering the full address. So customer can quickly order the food through this feature. If the customer wants any extra food items with their ordered food item, this feature is useful for customer. Every customer wants the cancellation feature. If by mistake they order the unwanted food item or they want to go somewhere urgently, they will cancel their order. After ordering the food item, customer can see their order details and status like food is cooking, your order is on the way etc. After ordering the food item, customer can their order status like how much time to deliver the food etc. and they will track the driver who wants to deliver their order. Restaurant menu is very important for every food delivery app. Customer can select the food items in that restaurant food menu and order that available food items only. Nowadays people showing interest to order food in their own language. so, we can provide the app in multilingual. It can cover all the people to order food who doesn’t know English also. It is also a very important feature to all the customers. Every time the customer order the food to different addresses. So they can add a new delivery address by using this feature. In the order history, customer can see their past orders. Customer adds their favourite or liked food items to favourites. So that customer can easily check their favourite food items. Admin can manage the content anywhere in the food delivery mobile app. Admin can also manage the categories like rice items, veg items, non-veg items etc. Admin can manage the advertising the app to post the offers and discounts. The main purpose of message alerts is to tell our information like any offers, appreciations for new registrations, order details etc. Admin can manage the locations for every food ordered customer and send it to the driver. Database is very important for every business. Here admin can manage the drivers, customers and restaurants info and backup is used for future use. Admin can see the total reports for analysation of business growth. Customer support is very important for every business. If customers have any doubts, they will contact to the customer support. Admin can give the amount of money to restaurant owners. So they can accept the withdrawal request from restaurant owners. Admin can see every order placed in their app and he/she can also see all the order details and status of the order. If the new order is placed in the app, admin can send the push notifications to the new user regarding order. Admin can have access to manage all the users registered in the app. This membership package is only for restaurants to add the restaurants in the food delivery app. Admin can also have access to manage all the restaurants that are present in the app. Admin can also track all the orders and all the drivers also. The restaurant owner will manage the restaurant opening and closing time and their menu in the restaurant panel. The restaurant owner will manage the orders from different customers and allocate the orders to the drivers based on locations. The restaurant owner will manage the coupons and offers to attract customers in the food delivery mobile app. Allow customers to pay the order amount using different payment methods. Allow the customers to connect their friends using social media. Driver can check the order requests and accept or decline the order as per their convenience from the restaurant. Driver can track the customer location and deliver the order to the customer in time. Driver can also mention if he is available or not at the order request time to delivery. Driver can check the order delivery information like name, order location etc. Driver can also set their profile(name, address, mobile number etc.) in the driver app. Driver can also check the previous payments and orders from the restaurant. In past days, when people are hungry they will go to the nearby restaurant or they will cook at home. It will take much time and people didn’t like to wait that much time when they are hungry. In the present days, technology is much increased. When people are hungry at just one click they will get their favourite food at their doorstep. So, food delivery mobile apps are increasing and these apps also have much craze in society. So, earning money is easily only by developing the food delivery app like Swiggy. Every company has its own terminologies although some of them are the same but there are few differences. 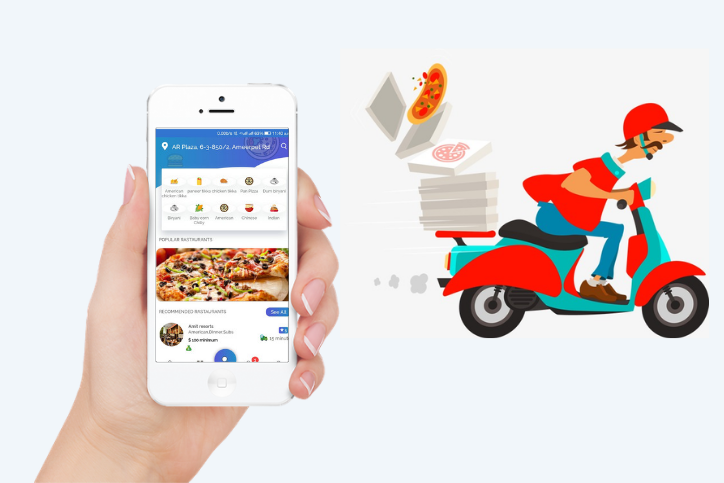 Why Food delivery app development means, this is the current trending business in the world and people also attracted to food easily. So, you can earn money easily just by developing the food delivery mobile app. If you want the best and unique food delivery mobile app to start your business, Techweblabs will provide you with the affordable cost and the custom features. How to build price comparison website in India? How do I build an Ecommerce android app?